This cherry clafouti (sometimes spelled clafoutis) recipe, also know as clafoutis aux cerises, is the most well-known version of the traditional puffed French custard cake. 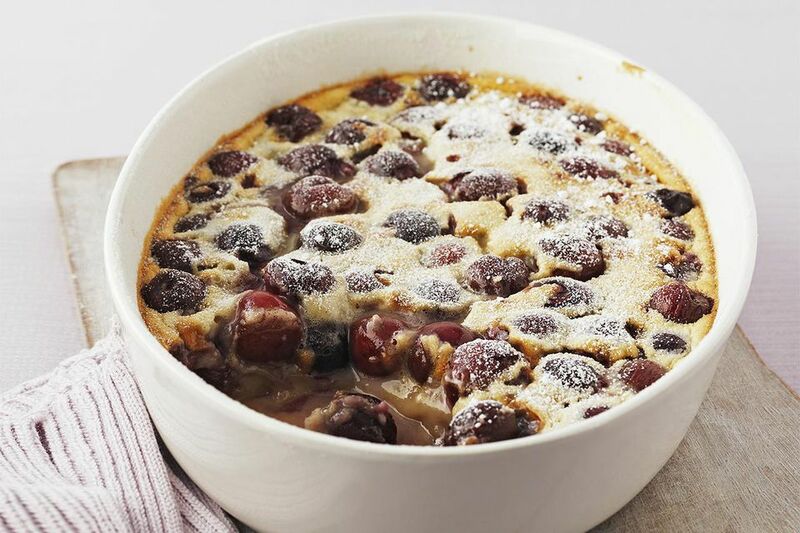 In France, it is customary to serve clafouti with cherry pits intact. For ease at the table, and to ensure dental safety, make sure to pit the cherries or forewarn your guests of the tradition. In a large bowl, whisk together the milk, cream, flour, eggs, sugar, vanilla and almond extracts, and salt until it forms a smooth, thin batter. Spread 3/4 cup of the batter onto the bottom of the prepared baking dish and bake it for 2-4 minutes. Watch the batter closely and remove it before it cooks through completely. It should just start to thicken and set when it is removed from the oven. Transfer the dish to a heatproof surface and arrange the cherries over the hot batter. Pour the remaining batter over the cherries and bake for 35-40 minutes, until a knife inserted in the center comes out clean.